Intraocular corticosteroids are used in ophthalmologic conditions such as macular edema secondary to vascular occlusions, diabetes, and uveitis. 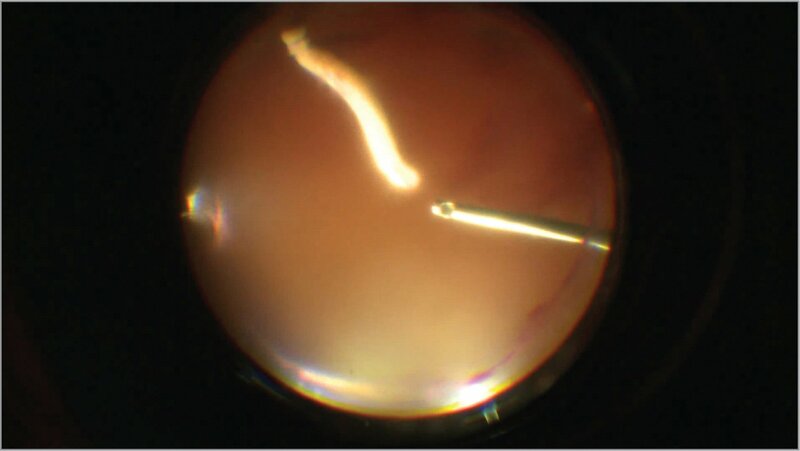 Infectious ocular diseases must be ruled out before intravitreal corticosteroid implantation. Here, the authors report a case that has been referred to their clinic for surgical treatment due to dense vitreous hemorrhage in the right eye after bilateral intravitreal dexamethasone implantation. As an intraoperative finding, diffuse changes in the color-like paleness of the retina as well as intraretinal white-colored deposits were observed. Serology tests were performed, and syphilis serology was positive. Intravenous penicillin provides resolution of inflammation. Intraocular corticosteroids are used in ophthalmologic conditions such as macular edema secondary to vascular occlusions, diabetes, and uveitis.1–3 Triamcinolone acetonide was used primarily.4 Clinicians now have the alternative of continuous-release corticosteroid implants. Primarily, infectious ocular diseases must be ruled out before intravitreal corticosteroid implantation. Ocular syphilis has varied manifestations in the eye. We report a diabetic case with vitreous hemorrhage due to the injection of bilateral intravitreal dexamethasone for the treatment of bilateral macular edema with an unnoticed presence of syphilis. A 53-year-old diabetic woman visited Bursa Retina Eye Hospital with the complaint of deterioration of vision in the right eye for the past 7 days after the injection of intravitreal Ozurdex implant (dexamethasone intravitreal implant 0.7 mg; Allergan, Dublin, Ireland) because of macular edema. In her medical history, we learned that she underwent intravitreal Ozurdex injections in her left eye 2 months earlier and in her right eye 10 days ago due to macular edema associated with diabetes. Visual acuities (VAs) were hand motion in the right eye and 20/80 in the left eye. On slit-lamp examination, we saw cell reaction in the anterior chamber of both eyes and dense vitreous hemorrhage in the right. 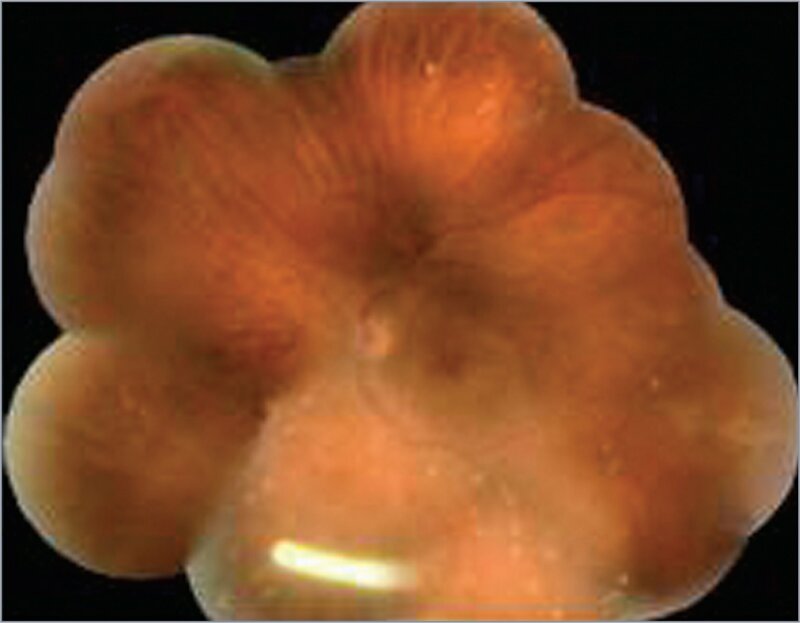 In the left eye, we detected the Ozurdex implant in the vitreous and diffuse changes in the color-like paleness and thickness of the retina, as well as intraretinal white-colored deposits (Figure 1). In the left eye, we detected Ozurdex implant and sectional retinal invasion including inferior retina, observed as diffuse changes in the color-like paleness and thickness of the retina as well as intraretinal white-colored deposits. Pars plana vitrectomy was performed in the right eye (Figure 2). After concluding core vitrectomy, we saw the same type of intraretinal deposits that were seen previously in the left eye (Figure 3). This led us to suspect a case of infectious bilateral retinitis. Vitreous culture was performed in order to detect bacterial and fungal infections; however, the result was negative. In the right eye, Ozurdex implant and vitreous hemorrhage were observed during pars plana vitrectomy. (A) After concluding core vitrectomy, we identified the same type of intraretinal deposits that were seen in the left eye previously. (B) Ozurdex implant was removed with vitrectomy cutter. Syphilis serology showed a venereal disease research laboratory (VDRL) test of 1:32 and treponema pallidum hemagglutination assay (TPHA) test of 1:160. Human immunodeficiency virus (HIV) serology was negative. Lumbar puncture was performed, and cerebrospinal fluid evaluation resulted in neurosyphilis. For syphilis treatment, 24 million units of intravenous penicillin G was infused per day for 14 days. The retinal lesions resolved during the next 4 weeks, but retinal hemorrhage was detected in the macula of the left eye (Figure 4). VAs were 20/50 in the right eye and 20/80 in the left eye. Intravenous penicillin G 24 million units per day for 14 days was infused. (A) The retinal lesions resolved. (B) Retinal hemorrhage was detected in the macular of the left eye. Syphilis is primarily a sexually transmitted disease, and the number of patients has decreased relatively in recent years. Ocular syphilis can be identified at any stage but is most frequently seen in secondary syphilis; 4.6% of secondary syphilis patients are reported to have ocular symptoms.6,7 Ocular involvement may be unilateral or bilateral. Because ocular syphilis is considered as an alternate of neurosyphilis, every patient with syphilitic uveitis should proceed with lumbar puncture and cerebrospinal fluid analysis to recognize neurological involvement.13 On the other hand, some authors claim that this is only crucial in the event of neurological symptoms or higher RPR titer values.14 Once cerebrospinal fluid analysis was performed, neurological involvement was detected in our case. Intravenous penicillin G 18 million to 24 million units per day for 10 to 14 days is recommended in syphilis treatment. Ceftriaxone, oral doxycycline, and azithromycin are the alternative treatments in the case of penicillin allergy. Based on the literature review, there were no cases in which vitreous hemorrhage occurred after dexamethasone injection for posterior uveitis associated with syphilis. Therefore, we would like to report our case. We believe that our case report would contribute to the literature. In conclusion, we would like to emphasize that infectious ocular diseases must be ruled out before intravitreal corticosteroid implantation, and that potential permanent complications could be averted via early diagnosis and prompt treatment of syphilitic uveitis. From Acıbadem Hospital, Department of Ophthalmology, Bursa, Turkey (FDA); Retina Eye Hospital, Department of Ophthalmology, Bursa, Turkey (SY, RA); Antalya Education and Research Hospital, Department of Ophthalmology, Antalya, Turkey (MKE); and Acıbadem Medical University, Istanbul, Turkey (EA). Address correspondence to Sami Yılmaz, MD, Retina Eye Hospital, Department of Ophthalmology, Sanayi Street, No:171, 16130, Nilüfer, Bursa, Turkey; email: samifmf1978@yahoo.com.